As fresh MBA candidate, It’s quite exhausting to deal with all the career management stuff and all the academics. A great opportunity to focus solely on the career stuff is to join the treks. 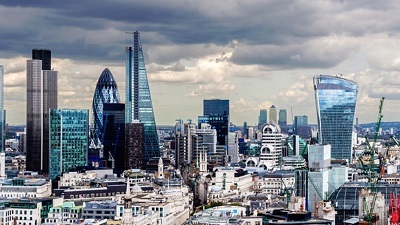 I was working in technology before as a project manager/salesperson so I was very excited to go to London and visit the HQ of the super famous tech companies. We had the chance to visit Google, Facebook, Uber among others. We also visited a few smaller fast-growing startups. The experience was really great, the HQ’s of tech companies are as insane as you would imagine. We basically spent 3 days in an episode of HBO’s silicon valley. 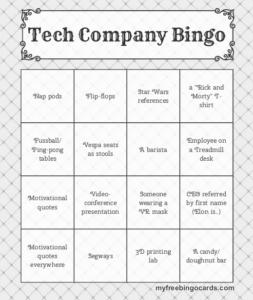 I present to you the Tech Company bingo! Apart from the great perks, fun environment and insane locations. The experience was also an eye-opener in terms of possibilities for MBA grads in tech companies. In general, without prior engineering or technical experience, it seems like it’s not easy to get a job around the product. The jobs offered for MBA graduates are mostly commercials & sales or Analytics. A typical job is “Marketing Manager” where you analyse lots of data to identify new segments to target. Only at Facebook and Uber, it seems that the analytical person is also working with engineering to bring concrete technical solutions and thus, see an impact on millions of users. Nothing is lost for those who can’t see themselves in any other career than Product Manager. We were advised to learn how to code. More precisely to get some proper online Python classes on Udacity. According to a few sources at Google, this book is also the bible to nail the interview. The large companies are effectively running like startups, where employees seem to have a lot of independence. Initiative is a skill that seems heavily expected from all employees of the different large companies that we visited. In a lot of those companies, they made clear that the hierarchy and organisational structure was somewhat blurry. Which is great for entrepreneurial and independent-minded candidates. The others could potentially feel lost and would probably underperform because of the lack of direction given to them. In general, working there seem great overall. Everyone looks super friendly and dynamic. It is a really refreshing change compared to the different delegations that we saw on consulting and finance events on campus. The first is IDEO. I had never heard of the company before. But apparently, they are SUPER famous. Basically, I would define them as a creative studio where companies can experiment with radical changes in their product/solution design. 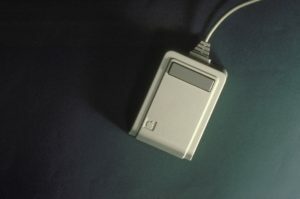 They helped an enormous amount of companies and probably their most famous product is the Apple mouse. Their offices just breathe creativity. There are post-it notes and hot desks everywhere. Every single item of furniture or tableware is out of a Vogue magazine. We were welcomed with a breakfast and were introduced to a few different projects. Both MBA graduates that presented their projects seemed to enjoy their work a lot. The freedom of action, these guys seem to have is just insane. But this is where us visitors had some reservations. I believe that IDEO is so creative and disruptive that it’s difficult for them to find proper KPIs and measure the success of their campaigns. As an example, some (if not a lot) of their projects never see the light of day. I would give as an analogy the concept of concept cars in the automotive industry. IDEO’s creative design help companies give long-term vision and innovative prophecies. They have an impact regardless if their visions actually make it to market, but the projects might end up as a daydream rather than a concrete solution. Finally, They were also a bit vague on their strategy to compete with regular consulting firms that are starting to enter the ‘creative design” market. They see themselves as very special, and I believe they truly are but do customers perceive them that way? Only time will tell. The second company is Filament AI. It’s a young company, started in 2017 ago by Phil (no pun intended) Westcott. IESE MBA 2011, he worked for the AI division of IBM for 5 years after his MBA. He confided to us that he considered himself very lucky to have witnessed first-hand the development of Watson, the IBM AI Engine. After gaining a great experience at IBM, Phil decided to start his own startup in the AI sector. Squeezed between the City and Tate Modern, the office is what you would expect from a tech startup out of the garage i.e. Screens and developers. The interesting angle took by Mr Westcott is that Filament AI started as a consulting firm. 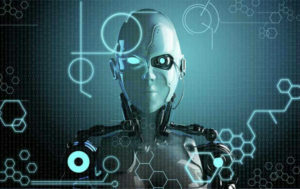 They would advise and educate other companies on AI practices sometimes delivering tailored solutions. This helped the company capture revenue to sustain itself and develop scalable products later. Filament AI didn’t choose the Venture Capital path and that makes its value proposition much more credible. They now design Chatbots and machine learning for large clients like General Electric and HSBC and just opened a new office in Toronto. The third company is called Winnow. Launched by 2 former management consultants, this company is tackling food waste in large kitchens. They realised that restaurants, hotels and other caterers had no idea how to capture data about their use of resources in the kitchen. How do you know if you ordered too many potatoes to cook the fish and chips on the menu? Winnow is your solution. They offer a connected scale, where employees will record everything they throw in the garbage. Employees will only need to record the weight by tapping once on a touchscreen. the MBA crew was very impressed by the product. I think it’s because they made a sustainable business from a quite noble objective. Winnow claims that they reduce the waste of the kitchens they work with up to 8% savings in food cost, which for large hotels or restaurants is an absolute jackpot. Now, we were not so convinced about the environmental impact of their solution. Nevertheless, they help big chains save costs and thanks to Winnow we are throwing less food in the garbage one kitchen at a time. Kudos. This trip was an absolute success. We got the chance to see our favourite companies from inside and in general gave us an amazing impression. The big lesson learned is that the more programs for MBAs are formal, the more the role is. I believe that doing an internship at Filament AI or Google and Uber would be totally different experiences. One bringing a more general approach to managing a company, the other one will teach you how to dominate sales in the modern era.